Guys! To all Talk N Text subscribers nationwide, here is a big news for you! 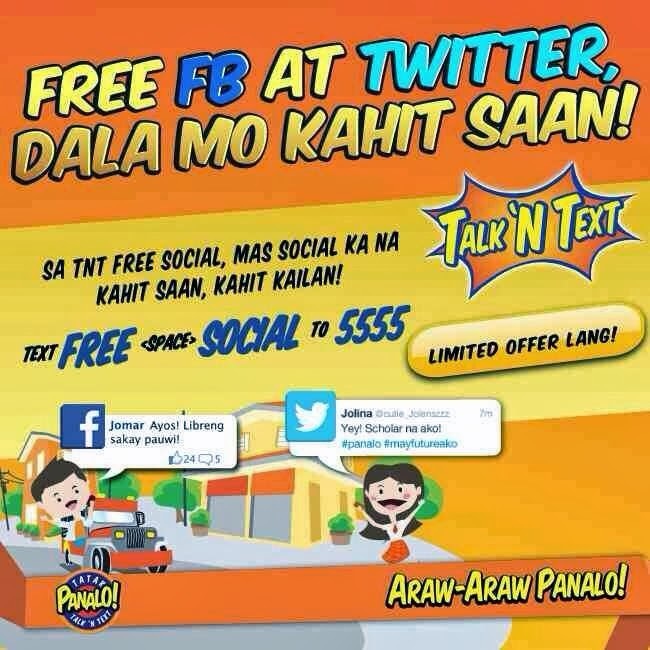 Talk N Text is now offering FREE access to your FB and Twitter. Sure, some networks already launch such promo, but they are only offering free Facebook, while SMART and TNT supports Facebook, Twitter, Foursquare, Google Plus, Linkedln, and Path all this for free. So, if you are interested, I suggest that you avail it now since this free offer won't last long though. Only Talk N Text knows if how many and how long this offer will last, their official banner says that "limited offer only". So rush now and text the code FREE SOCIAL and send to 5555, just take note that you must have at least P1.00 or free text to text the code. Join our Social Circle. Share your status, photos and tweet nonstop as TNT gives your this Limited FREE OFFER! Connect with friends online, anytime, anywhere! Want to have this? Here's you have to do. Enjoy your FREE FB and Twitter. Recommended to all Android phones. Guys, remember, this is just a LIMITED OFFER. To those who luckily availed this offer, congratulations.! Available to all TNT and SMART subscribers nationwide. na receive ko na po yong confirmation pero di parin ako maka connect sa fb at twitter. pano po ba abg gagwin? same...buti pa ang globe kahit no load pwede free fb,,,palpak ang tnt sa promo nilang to..
Download nyo po muna yung app ng twitter and fb. Limited Offer nga lang daw po.